A simple way to find friends, classmates and coworkers going your way. Our online ridematching system makes it easy to share seats or to catch a ride. Just about anyone can carpool - the distance of your commute doesn’t matter, as long as the pickup and drop off points are agreed upon. The system matches people based on proximity to origin and destination points and travel route as well as similar working hours and compatible carpooling preferences. 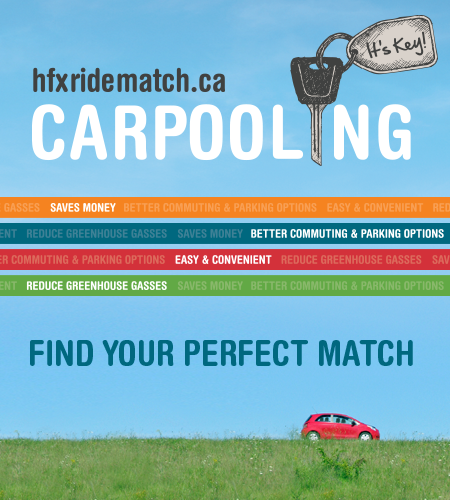 HfxRidematch.ca is FREE to use. It's secure. It's easy. It's fast. A confidential matchlist is returned instantly when you search for carpool partners. No personal information is released to potential matches. Simply email the individuals on your matchlist and then it's up to you to discuss the arrangements so that your new carpool will work for you! As an added bonus, many businesses provide premier parking for carpoolers and, finding a spot to park one car is always easier than finding a spot for more. The average commuter spends over $9,000 a year operating their car. By carpooling you could finally take a dream vacation.